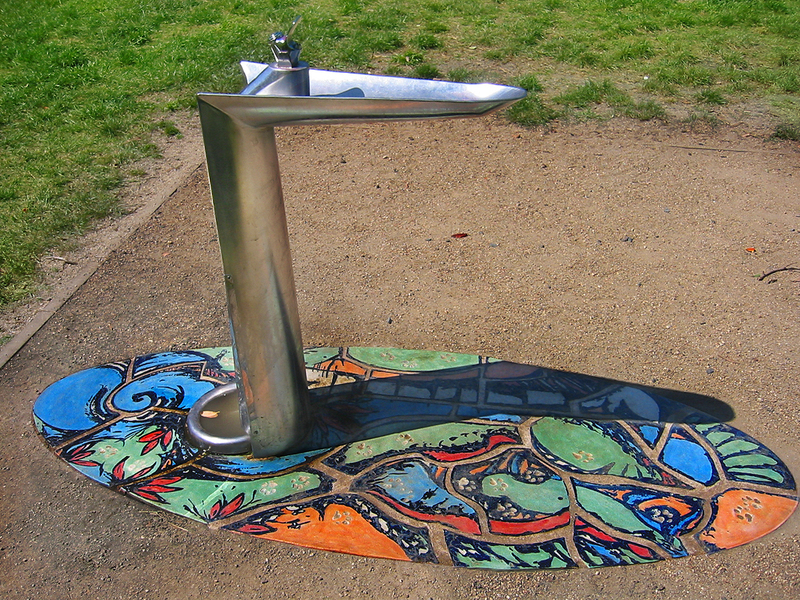 In 2005 I was commissioned to make an in-ground surround for a drinking fountain at the Hester Reserve in Port Melbourne. I used clay slabs in an elliptical form to mirror the shape of the drinking fountain. 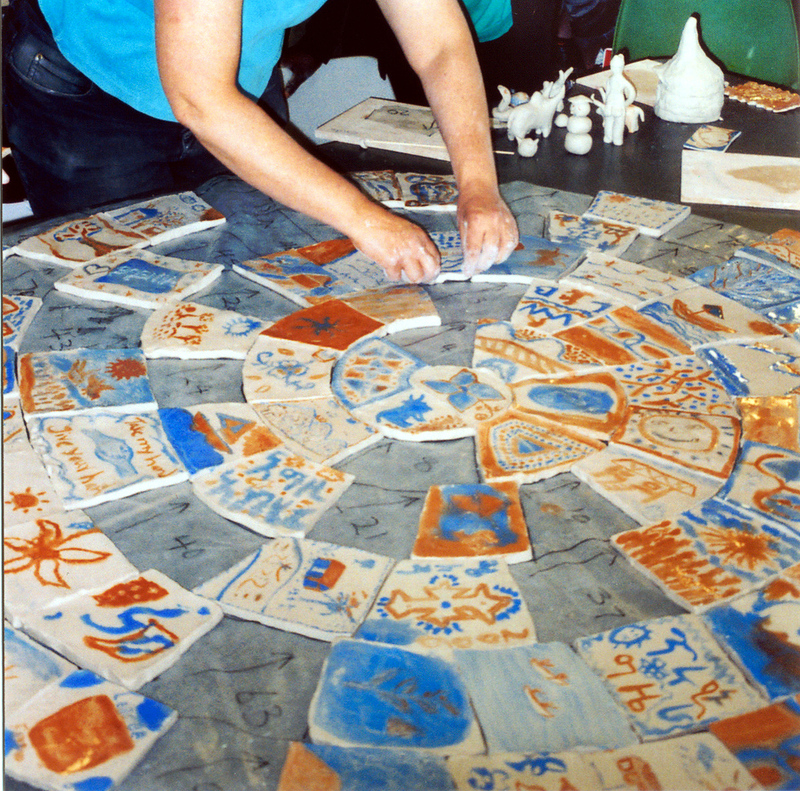 The clay slabs were cut in to shapes to fit the design. 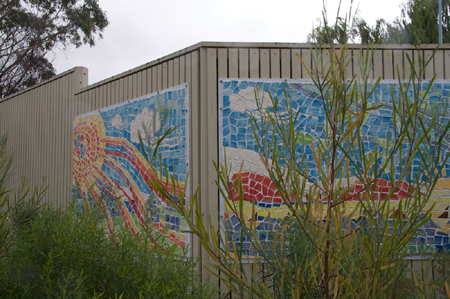 In the artwork I used the landscape to construct an abstracted view of the site that included the sea, parklands, railway tracks and trees, which all lead to the city along the oldest train route still in use today connecting the port to the city. Dog foot- prints are embedded into the work as the area was designed to be user friendly for the local dogs and their owners. I’ve just had the opportunity to take part in an amazing event that brought together seventy recently arrived refugee women from the AMES Integrated Humanitarian Settlement Program. The camp, held annually, provides opportunities for the participants to meet others who face similar circumstances. 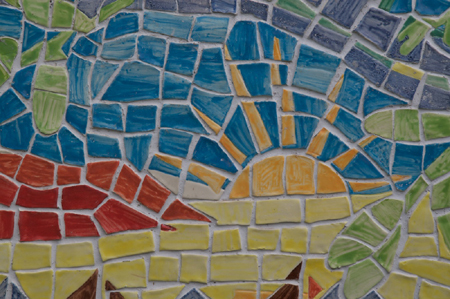 I put forth a proposal to make a large ceramic wall mural that could then be installed somewhere giving all the women an opportunity to come back on its completion and to have something that they created permanently on display. We made a 1.4 meter circle representing the world and the tiles spiral in, to incorporate the theme of the camp, “The Journey”. The aim of the camp was for women to be able to participate in a range of activities that allowed them to share their stories, to provide them with an understanding of Australia and its cultural richness, and to provide essential knowledge for the next stage of their lives here.